Chester, 27th September 2018 - The doors closed on the 2018 edition of TCT Show after three days of innovation, announcements and product debuts. More than 250 exhibitors converged on the NEC Birmingham, to create the largest show floor in the event’s history and to showcase game-changing design and manufacturing technologies to around 10,000 (audit pending) attendees. •	UK debut of Mimaki's 10 million colour 3DUJ-553 3D printer in partnership with Hybrid Services. •	Trumpf debuted its TruPrint 3000 metals system for the first time. •	Shapeways announced its full colour 3D printing service with Stratasys' J750 machine. •	Ultimaker unveiled new material alliances and print core for composites on the desktop. •	DyeMansion showcased increased colour capabilities for its DM60 post-processing machine. •	Materialise introduced a simulation module to its Magics software. •	Sculpteo announced the direct integration of FDM to its Fabpilot cloud-based end-to-end solution. 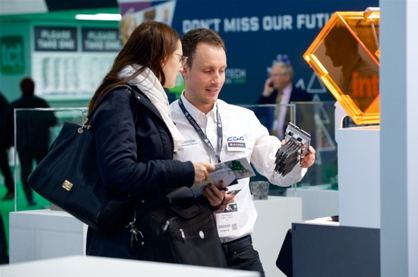 •	Several partnerships were also struck on the show floor; XJet secured a distribution agreement with Carfulan Group, Additive Industries teamed with Laser Lines to accelerate its UK presence and Link3D partnered with the ACAM Aachen Center for Additive Manufacturing. It’s been amazing and we’ve seen a really good result. I think TCT is the future because in this industry everybody needs to mix and build relationships within the industry. That’s the amazing thing about TCT, the mix of the universities, the people who want to acquire technology and the people who have a concept and want to try out their designs. Nick Brewer, Formlabs Events Marketing Manager.